Turkey and Korea carry on their long history of exchanges, and increasingly cooperate to secure prosperity and a harmonious world order, according to Turkish Ambassador to Korea Ersin Ercin. The two countries along with Mexico, Indonesia and Australia form MIKTA -- an informal alliance of middle powers dedicated to improving international governance and promoting peace, security and sustainable development. Even before Ankara and Seoul established diplomatic relations in 1957, Turkey dispatched some 21,000 troops -- the fourth-largest national contingent in the United Nations Forces -- to the Korean War to protect South Korea’s freedom and democracy. More than 1,000 Turkish soldiers lost their lives and 1,400 sustained injuries. In June, Turkish film “Ayla” -- based on a true story of friendship between a Turkish soldier and a Korean girl orphaned during the Korean War -- was screened in Korea. 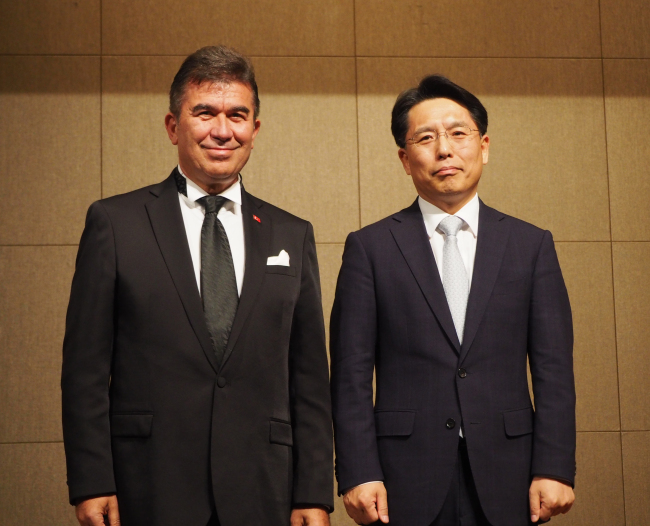 It offered a chance to reflect on the special friendship between Turkey and Korea. The two countries entered a free trade agreement in 2013, and have since expanded trade and investment as well as services cooperation. The areas of economic collaboration also cover transportation and infrastructure, information and communication technology, defense, education and culture. The total volume of bilateral trade last year topped $7.2 billion, with more than $6 billion of trade imbalance in favor of Korea. Korea has invested more than $2.3 billion in Turkey, while Turkey has invested around $35 million in Korea, according to the diplomatic mission. Korean companies have participated in several major infrastructure projects in Turkey, including the Northern Marmara Highway, Eurasian Tunnel, Yavuz Sultan Selim Bridge and Avrasya Tunnel projects. The Canakkale Bridge -- the world’s longest suspension bridge, to be completed in 2023, the 100th anniversary of the republic of Turkey -- will be built by a consortium of two Korean companies and two Turkish companies. Through Vision 2023, Turkey aims to be one of the top 10 economies in the world by 2023. Turkey is currently the 17th-largest economy in the world with a gross domestic product of $910 billion total and $10,500 per capita, or $26,000 in terms of purchasing power parity. Turkey’s economy experienced a 7.4 percent growth last year and is expected to register 4.5 percent growth this year, according to the World Bank. To counter the latest currency crisis driven by the sharp depreciation of the lira, the government announced its New Economy Program -- centered on stabilization, discipline and transformation -- in September, followed by a comprehensive road map aimed at tamping down inflation. During Turkish President Recep Tayyip Erdogan’s visit to Seoul in May, the two governments discussed enhancing ties in various fields as well as respective situations in their regions. They also signed several memorandums of understanding covering ICT and scientific research and development, industrial and technological partnership and health care policy. As a reciprocal step to the establishment of the Korean Cultural Center in Ankara in 2011, the Turkish Foreign Ministry will inaugurate its Yunus Emre Institute cultural center in Seoul this year.